Researchers have developed a super-thin, non-toxic, lightweight, edible ultra-white coating that could be used to make brighter paints and coatings, for use in the cosmetic, food or pharmaceutical industries. 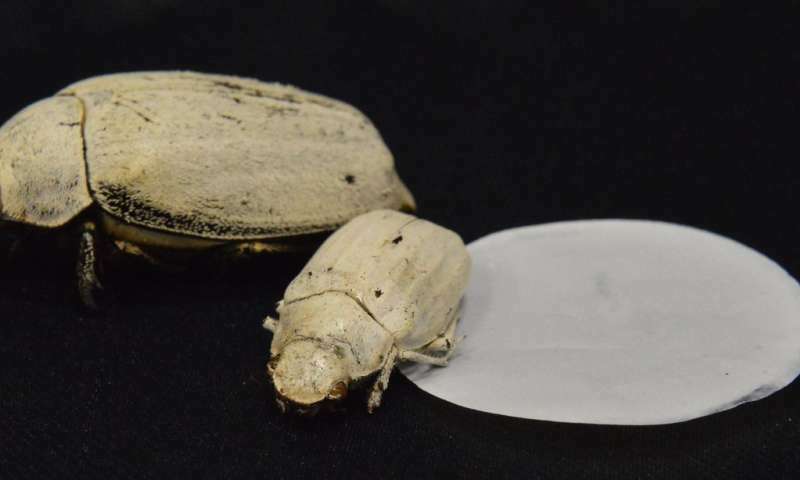 The material - which is 20 times whiter than paper - is made from non-toxic cellulose and achieves such bright whiteness by mimicking the structure of the ultra-thin scales of certain types of beetle. The results are reported in the journal Advanced Materials. Bright colours are usually produced using pigments, which absorb certain wavelengths of light and reflect others, which our eyes then perceive as colour. To appear as white, however, all wavelengths of light need to be reflected with the same efficiency. Most commercially-available white products - such as sun creams, cosmetics and paints - incorporate highly refractive particles (usually titanium dioxide or zinc oxide) to reflect light efficiently. These materials, while considered safe, are not fully sustainable or biocompatible. 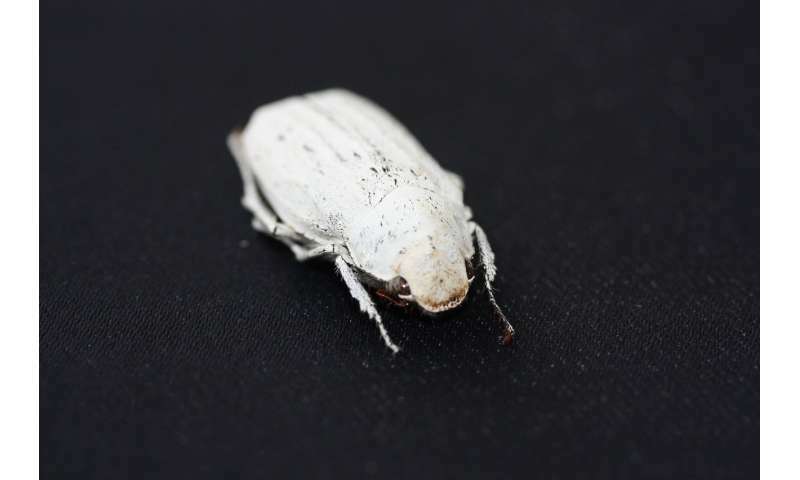 In nature, the Cyphochilus beetle, which is native to Southeast Asia, produces its ultra-white colouring not through pigments, but by exploiting the geometry of a dense network of chitin - a molecule which is also found in the shells of molluscs, the exoskeletons of insects and the cell walls of fungi. Chitin has a structure which scatters light extremely efficiently - resulting in ultra-white coatings which are very thin and light. "White is a very special type of structural colour," said paper co-author Dr Olimpia Onelli, from Cambridge's Department of Chemistry. "Other types of structural colour - for example butterfly wings or opals - have a specific pattern in their structure which results in vibrant colour, but to produce white, the structure needs to be as random as possible." The Cambridge team, working with researchers from Aalto University in Finland, mimicked the structure of chitin using cellulose, which is non-toxic, abundant, strong and bio-compatible. Using tiny strands of cellulose, or cellulose nanofibrils, they were able to achieve the same ultra-white effect in a flexible membrane. By using a combination of nanofibrils of varying diameters, the researchers were able to tune the opacity, and therefore the whiteness, of the end material. The membranes made from the thinnest fibres were more transparent, while adding medium and thick fibres resulted in a more opaque membrane. In this way, the researchers were able to fine-tune the geometry of the nanofibrils so that they reflected the most light. "These cellulose-based materials have a structure that's almost like spaghetti, which is how they are able to scatter light so well," said senior author Dr Silvia Vignolini, also from Cambridge's Department of Chemistry. "We need to get the mix just right: we don't want it to be too uniform, and we don't want it to collapse." Like the beetle scales, the cellulose membranes are extremely thin: just a few millionths of a metre thick, although the researchers say that even thinner membranes could be produced by further optimising their fabrication process. The membranes scatter light 20 to 30 times more efficiently than paper, and could be used to produce next-generation efficient bright sustainable and biocompatible white materials.